Even as the scrambler segment motorcycle welcomed a new member in Ducati Scrambler Sixty2 at the first day of EICMA show in Milan, Italy, the second day saw its competitor, the Benelli Leoncino. Designed at the new style centre of Benelli in its historical stronghold of Pesaro in Italy, the Leoncino shall include the emblem of a lion that denotes this city on its front fender. The motorcycle bears a lot of resemblance to the Ducati Scrambler range in terms of design. The Leoncino comes with low exhaust position, chunky wheels, USD front forks with 50mm diameter topped with a LED light. The seat is finished in Alcantara leather and the rear gets an LED tail light. The tyres are 110/80 section up front and 150/17 section at rear, which is fitted on 19-inch and 17-inch wheels respectively. The Leoncino is powered by a brand new 499.6cc, twin-cylinder engine with liquid cooling developing 46.9bhp at 8,500rpm and 45Nm torque at 4,500rpm combined with a six-speed gearbox. The Benelli's scrambler motorcycle is equipped with 320mm twin disc brakes with four piston caliper upfront, while rear tyres get 260mm single disc with two piston caliper. The Leoncino is currently far from the production model, which is expected in 2017. The motorcycle will feature standard ABS in production model. There is no information on the arrival of Leoncino to India via DSK-Benelli. However, DSK-Benelli already voiced its plans to bring new models to India in the coming years. That activates the possible India entry. 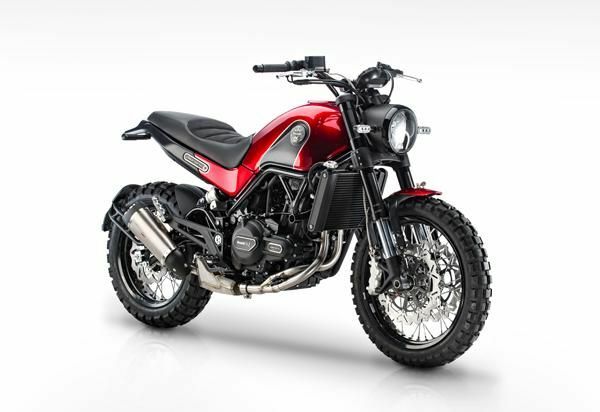 Benelli Leoncino is expected to be part of 2016 Auto Expo line-up of DSK-Benelli.